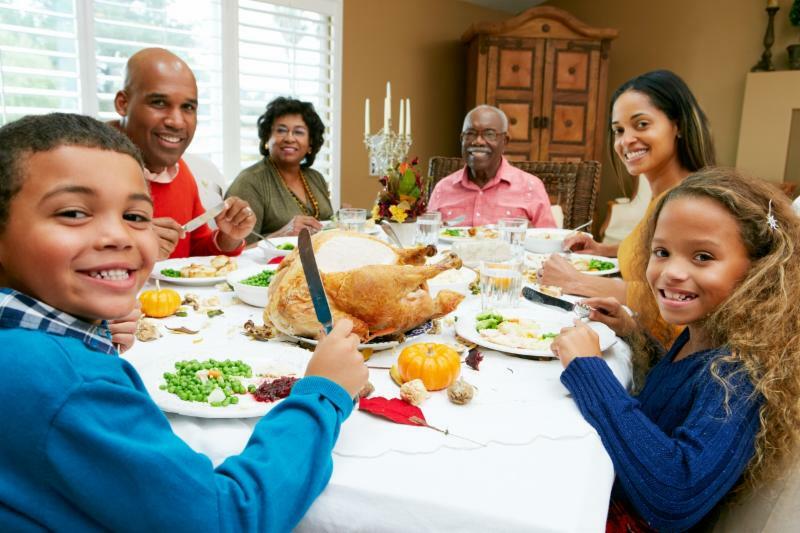 For younger children, discussions around the family table help build their vocabulary and language skills. For school age children and teens, family dinners often contribute to parental involvement leading to better grades and overall academic achievement. Children who eat regular family meals, consume more fruits and vegetables and are less likely to become obese or develop an eating disorder. Eating together can also provide a protective support network, as children are less likely to engage in risky activities (such as smoking, drinking and sexual activity) and are more-readily able to recover from adversity, such as being cyberbullied. Whether breakfast, lunch or dinner, family meals are a great way to connect and show that you care. Remember to make these meals free of media (even background TV) so that you can focus on what each of you has to share. Try eating together 5 times a week, and with older children, try having them be part of the meal making process. Thanksgiving may only be once a year, but eating together as a family and enjoying each other’s company can be a daily tradition! A: Because we are only now starting to learn about how children are affected by the screen media they use and how they use them, only time will teach us how what they do at age 3 influences who they become at age 13 or 23. What we do know is that the best way for children to use these devices is directly with a parent or other caregiver. Read the full answer here. Susan Alden, an Assistant Librarian at CMCH and former high school educator, shares how her perspective on students’ use of technology in education changed after she left teaching to pursue a career as an academic librarian. Take a look at the full post and follow along every month at Ask The Mediatrician. In Internet use and verbal aggression: The moderating role of parents and peers, researchers found that teens who are able to talk openly with their parents about their Internet use were less verbally aggressive. Read more. Watch Dr. Michael Rich and other experts on CBS News discuss children and media multitasking. Watch here.